The Crimean museums registered according to Russian legislation, which are the plaintiffs in the "Scythian gold" case, have nothing to do with the legal relations in which the artefacts were moved to the Netherlands, officials from the Ukrainian Justice Ministry said. "We believe this is an improper plaintiff, which we pointed out to the court immediately. The lawyers for the so-called Crimean museums are especially cynical because they rely on Ukrainian legislation in their arguments and they believe they have the right to store these artefacts under Ukrainian legislation," the Justice ministry's press service quoted Ukraine's Deputy Justice Minister Serhiy Petukhov as saying. The deputy minister said he believes the plaintiffs in the case who represent Russia's position are no longer legal entities. The hearing of the case involving artifacts from the exhibit 'Crimea – the Golden Island in the Black Sea' from the collections of four Crimean museums – the Historic-Cultural Reserve in Kerch, the Taurida Central Museum, the Historic-Cultural Reserve in Bakhchisarai and the Khersonesus Tavrichesky National Reserve – began in a court of appeals in Amsterdam on Monday, March 11. According to Ukraine's Justice Minister Pavlo Petrenko, there are more than 565 museum items from Ukrainian museums in Crimea in the territory of the Kingdom of the Netherlands. They are mostly archaeological finds. The insured value of the collection is EUR10 million. Since the Netherlands has refused to recognize Crimea's annexation by Russia, the question of whom the collection should be returned to arose after the closure of the exhibition in August 2014. 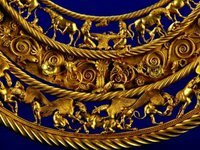 In their lawsuit against the Allard Pierson Museum, the Crimean museums sought the return of the "Scythian gold" collection, which comprised 2,000 objects, from the Netherlands to Crimea. On December 14, 2016, a district court in Amsterdam ruled in Ukraine's favor. On January 16, 2017, the four Crimean museums appealed the decision made by the Amsterdam district court.